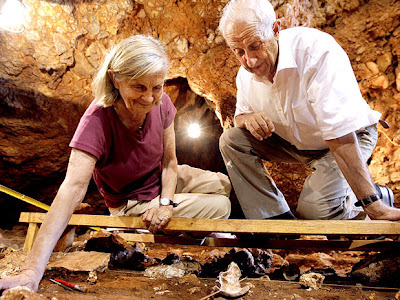 Saturday August 13th a group of students (Ludovic Dolez and Sébastien Lepvraud) working on the excavation of sector S11 in the Lazaret cave, near Nice (southern France) discovered a 170,000 years old forehead of a Homo Erectus. 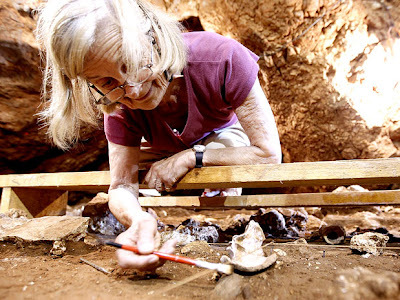 Paleontologist Marie-Antoinettde de Lumley who is in charge of the excavation since 1961 analysed the find: "It belonged to a young, less then 25 years old hunter nomad. It's an important find and might learn us more of the progressive evolution of it's successor, the Neanderthal man." For the moment the bone is still left to dry in place for a few days before it can be safely removed. In forty years of excavation on the site about 2.4m of earth has been removed and more than 40,000 discoveries have been made and catalogued.